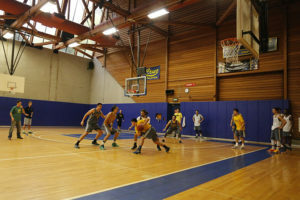 While most students spent the holiday season in the comfort of their homes savoring plenty of home-cooked meals, UC Santa Cruz’s basketball, swim and dive teams were kept busy with competition. For these individuals, winter break consisted of repetition, sweat and a few road trips, as each team looks to end the season strong. Despite the holiday festivities, the men’s basketball team played four road games within a week, opening with back to back matches at La Verne on Dec. 29 and at Redlands on Dec. 30. During its trips to visits to Southern California and Memphis, Tennessee, the team went 2-2. The Slugs were victorious in four of their last eight matches and hold a 5-12 record with eight games remaining. Even though the playoffs seem to be out of reach for the men’s basketball team, DuBois remains positive in his team’s accomplishments this season. With six Division III wins last season, the Slugs set the program record for most Division III wins in a season. With three Division III games left in their schedule, DuBois hopes his team can beat last year’s accomplishment. The women’s basketball team also had a busy holiday season. The Slugs participated in two tournaments, the December Classic in Santa Cruz on Dec. 19 and CLU Thousand Oaks Inn Classic on Dec. 27. The team also had roughly four to five days off for the holidays before beginning its road trip in Southern California on Dec. 27. 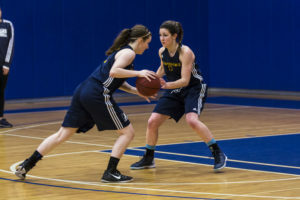 “We have to be very efficient with our time as we don’t have a great deal of practice during the break,” said women’s basketball head coach Todd Kent. “The break is less about individual improvement in practice and more about game planning to win many games in such a short period of time. The women’s basketball team currently sits on a 7-7 record with roughly 10 games remaining before participating in their first Great South Athletic Conference Tournament. If the Slugs can win-out their conference tournament, they would have an opportunity to compete for a bid in an NCAA national tournament later this year. 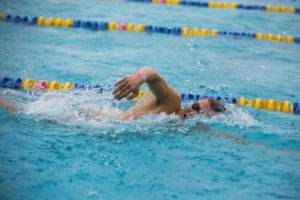 UCSC’s swim and dive team was another team to compete over the break. Swimmers hit the pool as early as 7:30 a.m. for morning practice. The team returns for a second wave of practice at 1:30 p.m. known as Smash and Roll — a series of stretches and recovery exercises before swimming from 2-4:00 p.m. The team also uses the weight room for conditioning every other day of training camp. Even though the team is required to stay for training camp, Musch confirmed they get about a week off during break. This year, the break fell before the Chris Knorr Invitational on Jan. 1 and 2 against Cal Lutheran. The Slugs finished top in nearly every category. In the men’s team competition, Santa Cruz won scoring 843.5 points to Cal Lutheran’s 449 to Pacific Lutheran’s 303.5. The women’s side was also victorious, tallying 742 points to 513 to 327. This occurred after the meet was delayed an hour due to water overflow and cold temperatures. But this didn’t affect the Slugs competitiveness as they had swimmers finish in the top 10 in every single event that took place that evening. Additionally, Kelley Henderson was awarded the Chris Knorr Leadership Award.